Class reunions are wonderful events. You get to see what happened to all your old classmates, and hope they are fatter, uglier, and less successful than you are. Not really, the important thing is to go and reminisce about the old days. Tell old stories, if you can remember any, and sing songs that were popular back in the day. Personally, I will be attending my 40th high school reunion pretty soon and I’m looking forward to it! Hoping my old friends are there, and hoping there’s good food. Of course one thing about reunions is that you may see some people you really don’t want to see, but in most cases everyone gets a little tipsy and has a great time. Music, food, some adult beverages are all necessary for a successful reunion, but it’s a really nice touch if you have custom class reunion T shirts made for everyone. It’s fun for everyone to wear their shirt, or just take it home so people will have it as a nice remembrance. 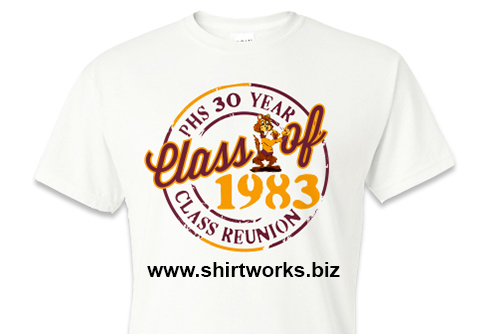 We started making T Shirts for people celebrating their class reunions in the Chicago area back in 1976. Right here in our shop on Marion in Oak Park. If you’re having a reunion soon, we would love to design something nice for the occasion and help you enjoy your special event even more. Send us an email at info@shirtworks.biz and let us know the date for your event and what you have in mind. We will respond promptly.